Unusual by modern standards, the prime feature of the Zeiss Ikontas (in all versions and film sizes) is their ability to fold up flat into a very small package -- making Ikontas the highpoint of small camera, large negative. 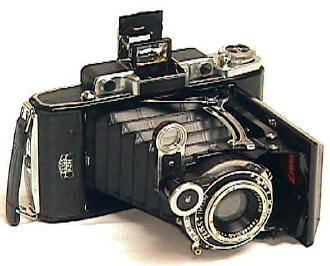 No modern camera boasts such a large negative for its size. Of course the bane of all folders existence was lack of rigidity and keeping the lens parallel with the film. Zeiss skilled engineers turned these problems into Ikonta strong points, elevating Ikontas to be generally considered the best folders ever made. 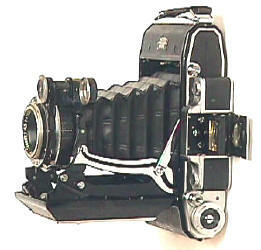 Zeiss Super Ikonta C's have a large 6x9cm format -- larger than today's Pentax 6x7 or Mamiya RZ! Made from the early 1930's to the middle 50's, they came with a bewildering combination of different shutters and lenses. Its best lenses were the 105/3.5 or 105/4.5 Tessar. 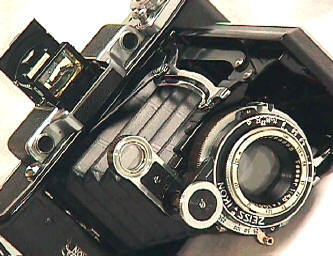 The best Tessar was the post war coated version. The best shutter is the post war synced Compur. 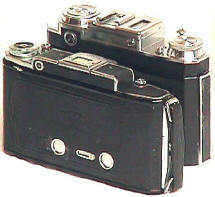 Simplified versions without the rangefinders, were "Ikontas" as opposed to "Super Ikontas." Luckily the Super Ikontas use easily available 120 film in your favorite modern emulsion. All versions left the factory which a film plane mask so you could shoot either 6x9 or 6x4.5 pics. 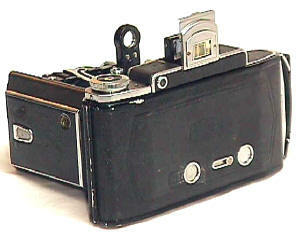 The pre-war cameras had uncoated lenses without flash sync. The pre-body has a decorative dial on the right front top plate. Post-war bodies like the one above had flat right hand top plates without the decorative dial. All but the earliest post war Ikontas had coated lenses and synced shutters. Notice that Magnifying looking thing attached to the top of the shutter. That is part of the Super's rangefinder system. It folds down to close the camera. Forget to bring it back up, and you will have no rangefinder image. Depending upon the lens/shutter combination, typical shutter speeds ranged from 1 second to 1/250th or 1/400th, while maximum apertures ranged from f/3.5 to f/4.5 with the C's 105 lens. T The very compact C weighs in at only about two pounds with film....or less than your super duper 35 SLR with zoom lens. 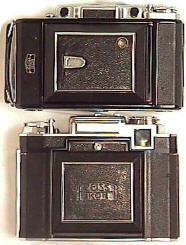 The C has separate rangefinder and viewfinder windows. The rangefinder image is fairly bright and useable if cleaned recently. 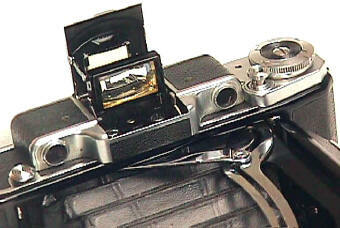 The folding albada viewfinder sits on top of the rangefinder assembly. While the folding finder succeeded admirably in terms of saving weight and reducing size, today they are pretty well a disaster as a usable finder. Age well they did not. I have never seen a bright and easy to use C albada finder...some 40 to 60 years after they left the factory. They usually remind me of looking through yellow wax paper. IF you plan to use it a lot, consider having your repair man remove the folding finder and replace it with a quality finder from Leicas or similar cameras. 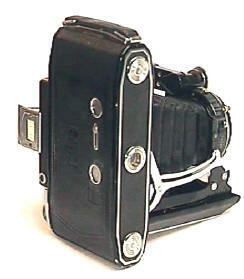 The left top mounted shutter release was something of a luxury features, since the photog did not have to futz around with a shutter mounted release. What looks like a shutter release on the camera's right side is the button to open the folding front door. Bellows? Did I say bellows? Yep. That's how the Ikontas folded down. Make sure they are in good shape...replacing them can be expensive. Strangely, the Super Ikonta 6x9 format C is actually lighter and smaller than the 6x6 format Super Ikonta BX! The C weighs 2 lbs., the BX 2 lbs. 6oz. While the C is longer at 165mm Vs 151mm, the thickness is almost identical at 50mm Vs 49mm, and the BX is much taller at 98mm Vs 112mm. True, the BX has a meter (of questionable value by modern standards) and a much better combined viewfinder/rangefinder than the C's separate usually very hazy folding Albada finder and rangefinder, the C's still weighs less. The Super Ikonta C's large negative size and light weight make it my favorite folder.